Also known as Doy Bags or Stand Up Pouches. These products are made from various barrier films and are widely used within the food industry and many other sectors are finding them very versatile too. Stand Up Pouches are an excellent choice for retail environments as they have super shelf presence and hold awkward shaped items well. 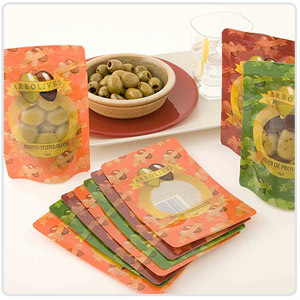 Once printed these pouches will enhance the look of the product without the need of secondary point of sale packaging. These products should not be limited to food packaging as they can enhance the look of any product from electrical components to toys or jigsaws. Various film laminations are available to bring new dimensions to these products and they are now able to be used in microwaves, freezers and provide a wide variety of barriers required to give longer shelf life expectancy to products. These are now being used for liquids and spouts can be easily inserted to assist pouring. We will liase with your existing designer or offer a complete design and production service. Due to the complexity of these products, you are encouraged to discuss your requirements to ensure the correct specification for your product. Please visit our Contact Page to make an enquiry and a member of staff will be in touch to discuss your requirements further. 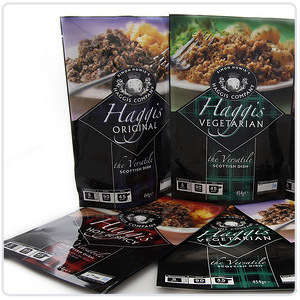 Kingscroft offer a wide range of unprinted Stand Up Pouches - with or without grip seals - and can also offer recommendations on semi-automatic to fully automated filling and sealing machines. Please contact us to discuss your requirements and recieve a competitive quote.